A new (old) way to spread the good news. Say "cultural commentary," and semiotics—the study of signs—does not spring to mind. But Crystal Downing, distinguished professor of English and film studies at Messiah College and author of Writing Performances: The Stages of Dorothy L. Sayers and How Postmodernism Serves (My) Faith, believes semiotics is a topic that contemporary Christians can't afford to ignore, especially if they wish to truly be the body of Christ in the various cultures in which they find themselves. Semioticians don't study street signs (or at least, not exclusively); rather, in its most basic form, a sign is "something that stands for something else," and semiotics is the field devoted to parsing and understanding how these signs operate in our language and culture. 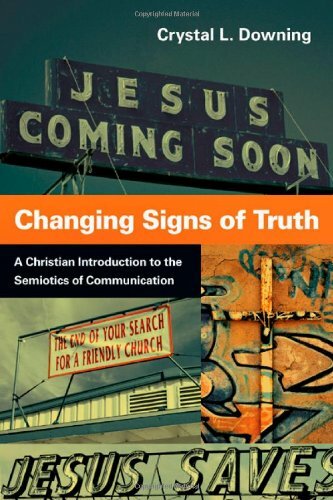 Downing's book, Changing Signs of Truth: A Christian Introduction to the Semiotics of Communication, is a lucid, accessible, and often downright enjoyable introduction to this sometimes esoteric field of study. The book is a sort of hybrid between textbook and cultural commentary, liberally sprinkled with examples from popular culture as well as Downing's own experiences that help illustrate and argue for what she calls the necessity of the "(re)signing of truth." Most readers … look more at what the signs point to than at the signs themselves. So, I have written Changing Signs of Truth to fill a gap in the conversation between Christianity and culture. For the less we understand how signs work, the more powerfully they control us. Downing wants readers to "become skilled sign-readers, able to distinguish among diverse cultural powers in order to assess their threat and respond appropriately." She does this by taking us through a comprehensive but plainly written history of semiotics, from Saussure and Peirce all the way through Bakhtin and Derrida. She handles her topic deftly, moving between history, explanation of dense theory, and examples that help the reader step back and see how their own cultural context has colored their view of how to communicate truth. As she points out, many Christians are unaware of the signs they have adopted as if they were the truth, rather than a way of conveying the truth: "Some Christians feel outrage at the direction culture is taking while never considering how their own protestations end up subverting not only their message, but also the cause of Christ." (She cites, for instance, the shifting of the meaning of the sign "Xmas.") Such misunderstandings—as most of us can sadly attest—lead to all manner of trouble, ranging from overuse of "Christianese" to outright objectionable behavior that throws up walls between Christians and those who do not believe: "While never giving up on the Bible as our God-inspired guide to faith and practice, we need to re-sign how we talk about it in order to break both idols and communication barriers." Put "changing" and "truth" in the same sentence (or book title), and most evangelicals' dander gets up at least a little (not without cause). Yet Downing is NOT arguing that truth itself changes; rather, she wants us to recognize how the signs or pointers of truth change from culture to culture. Her book helps us see how this happens, and how we might know when to adopt new metaphors—metaphors to "carry us beyond stale, clichéd forms of communication" [her emphasis]. She concludes her argument with what she calls "ten fertile principles" to help readers understand how to (re)sign truth, all of which are rooted in both orthodox Christian theology and a deep concern for those around us. Downing's great skill is in translation—which is to say, taking ideas that are generally understood (if familiar at all) as rooted in postmodern theory and showing how they are accessible, reasonable, and often, in fact, rooted in much more ancient ideas—not least, in the Bible itself. For instance, when she uses the word hegemony (which many associate with Marxist notions about power and class), she takes care to point out the various ways that the word appears in the Greek New Testament, and explains that "Scripture, then, anticipates theories developed by Gramsci, Althusser and Williams: that ideas can rule powerfully as human leaders … [but unlike Althusser], Christians believe they have a choice: to freely respond to God's summons." The publication of Changing Signs of Truth is excellent news for professors and students who grapple with how semiotic and postmodern theory fits into robust, orthodox Christian theology; it's also a boon to cultural commentators and laymen who intuit that there's something fundamentally off about the way Christians often discuss culture but can't quite find the language to describe it. Furthermore, Downing's book adds a much-needed dimension to the current conversation about how Christians ought to live in and reach out to the culture around them; Christian students headed to graduate programs in the humanities will find it especially helpful, as will pastors seeking to grapple with this issue. Downing has done the academy and the church at large a great service in a highly readable, often winsome argument.